It used to be that once you were stuck, that was it. There was no way out,” says Rio. “But this book gives men an escape hatch. The book, available for download on the Kindle, offers solutions for one of the oldest and most frustrating questions in the dating world: How do you avoid the friend zone? The book's first goal, then, is to get it so that guys completely bypass this situation. It offers readers a series of tips that will establish themselves immediately as flirts, forcing women to always keep the man's sexuality in the back of her mind. Knowing how to flirt correctly is the key component from keeping a woman ever settling completely into the non-sexual comforts that come with a platonic friendship. The sneaky little tweaks that the book offers will keep her from ever having the “let's just be friends” talk. 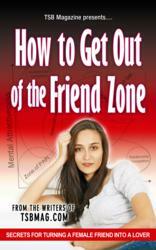 But “How to Get Out of the Friend Zone” also offers something much more valuable to its readers. It also gives men who are mired in the depths of the friend zone something they have never had before: A roadmap for how to escape it. It details specifically when to introduce sexuality into the relationship without being creepy about it, the signs to look for that she wants to be “more than friends,” how to use her innate jealously to force her to fight for the man's attention which deepens the feelings she has for him, and exactly when the right time to go for the kiss is. It also gets in the signs a girl likes you. Another aspect that “How to Get Out of the Friend Zone” seeks to reverse is the conventional thinking that has been handed down by various romantic comedies through the ages of it always being a good idea to let the girl know how you feel. “It's an all-too-common mistake guys make,” says Rio. “And a death sentence for ever getting her into bed.” Instead, the book details the benefits of holding back your feelings, what you should do instead, and just when the right time is to reveal your true intentions to her. For years the problem wasn't men's willingness to try to turn a friend into a lover, it's just they never knew how. The book changes that for good.